We're coming to the end of the Little House series. 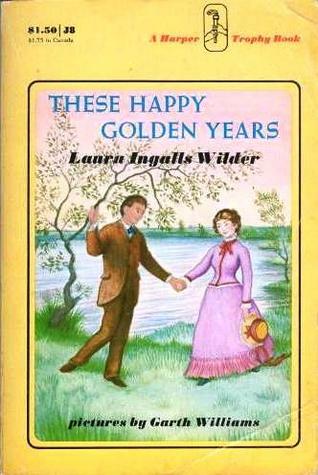 We just wrapped up the eighth book, These Happy Golden Years, which ends with Laura and Almanzo's simple wedding in Reverend Brown's front parlor, and only have the very short The First Four Years left. After supper the night before Laura and Almanzo got married, Laura brought Pa his fiddle and asked him to play. He rosined his bow and started with Mary's song, "Highland Mary" (which I linked to in my Friday Four a couple of weeks ago, so you can go listen to it again here if you'd like) and then "he played all the old tunes that Laura had known ever since she could remember." The fiddle sang on in the twilight. It sang the songs that Laura knew in the Big Woods of Wisconsin, and the tunes that Pa had played by the campfires all across the plains of Kanses. It repeated the nightingale's song in the moonlight on the banks of the Verdigris River, then it remembered the days in the dugout on the banks of Plum Creek, and the winter evenings in the new house that Pa had built there. It sang of the Christmas on Silver Lake, and of springtime after the long, Hard winter. Reading this scene aloud to the boys I started to get all choked up and had to stop for a bit to collect myself before continuing on. There are precious moments in your life when you know change is coming - big change - and even though you know it's a good kind of change, it still means leaving behind something you love. Laura loved Almanzo and wanted to marry him, but it meant she would no longer live with her family, and quiet evenings listening to Pa play the fiddle would be a rare occurrence. * there are still no famous female economists. * 1/3 of 10 year old girls' biggest worry is their body. * people still ask what the victim was wearing. * I used to think calling my brother a girl was a legit insult. * I considered not getting this photo taken because I'm not wearing makeup. I printed out several of these Christmas coloring pages for the kids at my church to color at the ward party tonight. Nice, simple activity to keep them busy. I'm thinking I'll print some out for my own kids, too!